Geography and size: Old Greenwich encompasses Greenwich’s easternmost area running from just north of East Putnam Avenue, south, to the waterfront. Old Greenwich has two basic geographic areas, known as South-of-the-Village and North-of-the-Village. The village is the main shopping area of Old Greenwich (see below). 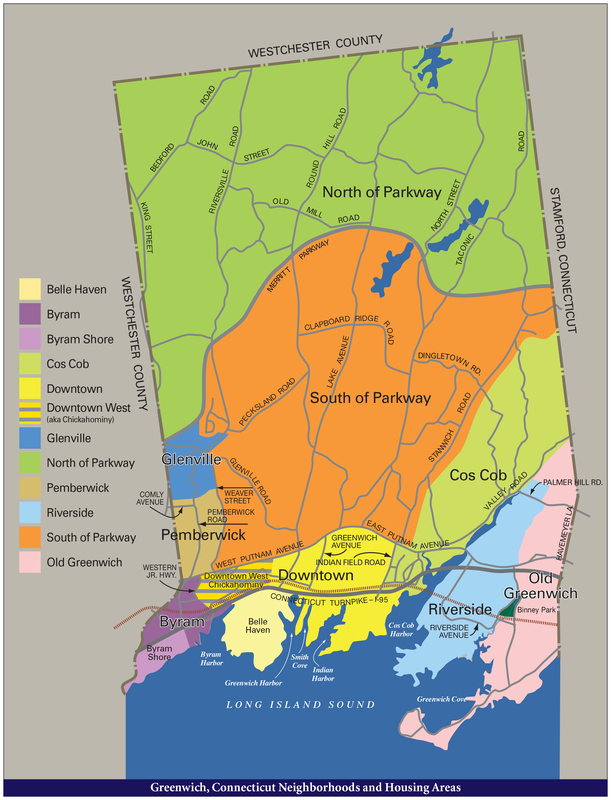 Parks/playgrounds/marinas/beaches: Old Greenwich has two major parks, the 22-acre Binney Park and the 147-acre Greenwich Point. Binney Park incorporates a picturesque duck-pond with lovely stone bridges, trails, three ballfields, four tennis courts and children’s playground on the southern end. Greenwich Point (also known as Tod's Point) features expansive beaches, a 2 ½-mile driving/biking roadway, nature trails, holly groves, the Bruce Museum’s Seaside Museum, the Old Greenwich Yacht Club, two-concession stands, multiple restroom facilities, picnic and barbecue areas and boat mooring facilities. Added recreational facilities with playgrounds and ball fields are those at Old Greenwich Elementary, North Mianus Elementary, Eastern Middle School and Old Greenwich’s Eastern Greenwich Civic Center. The closest public marina with slips available is in Cos Cob on the Mianus River. Only the Eastern Greenwich Civic Center has night-lit tennis courts. Recreational membership clubs with facilities: There are four membership clubs with facilities in Old Greenwich. They are the Old Greenwich Yacht Club, the Rocky Point Club, the Innis Arden Golf and Tennis Club and the Old Greenwich Tennis Academy. Shopping and restaurants: Old Greenwich has a number of shopping areas with the most popular located south of the railroad line on Sound Beach Avenue. Here there are 30-plus, largely local-based consumer goods and consumables shops, apparel stores, banks, restaurants and a supermarket. The only supermarket is Kings Super Market just south of the Old Greenwich Train Station. North of the Old Greenwich Train Station on East Putnam Avenue there are several small shopping areas offering a variety of stores. Transportation: The Old Greenwich Train Station affords great service to Old Greenwich residents. Connecticut Transit, via the Stamford service line, makes morning-rush runs and scheduled stops in Old Greenwich's southern region. Interstate 95 and East Putnam Avenue (Route # 1) are the major roadways. Travel time to mid-town Manhattan, no matter the mode of transportation, is between 55 and 65 minutes. Neighboring Stamford is no more than 10 minutes away.